•This tool creates a new network free of pseudo nodes. The advantages of this are: it simplifies the network without loss of connectivity or change in geometry, reduces the size of the RivEX topological dictionaries, speeds up processing and can resolve stack overflow errors caused by some of the recursive algorithms when run on very large river networks (>1 million polylines). An example of the impact a network with many pseudo nodes is discussed below. RivEX will drop all attribution and any M or Z values in the geometry. Removing pseudo nodes is often the FIRST step you will want to do before attaching any other attributes. 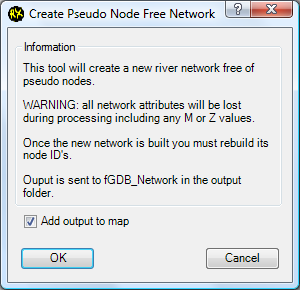 •To use this tool expand the Nodes tree node, select Create network free of pseudo nodes processing task and press Run Tool button. •The following dialog warns you about the output, you have the option to added the new network to the map when it has been created (this is default). •Output is sent to the Output sub-folder in the RivEX_Workspace folder. The new network is written to a file geodatabase called fGDB_Network.gdb. If a dataset with the same name already exists in this geodatabase you will be prompted to delete it. •The dataset will be suffixed with "_PseudoNodeFree". 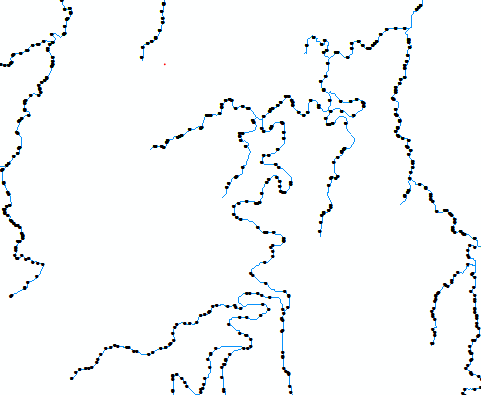 For example if your river network was called YukonNet then the new network would be called YukonNet_PseudoNodeFree. •The new network will have a single field called RIVER_ID which is an unique ID for each polyline. •This tool uses existing geo-processing tools to achieve a pseudo node free network. The network below was derived from a DEM with first order streams removed. The result is a network comprised of 270,957 polylines with an unusually large number of pseudo nodes (261,864 in total). 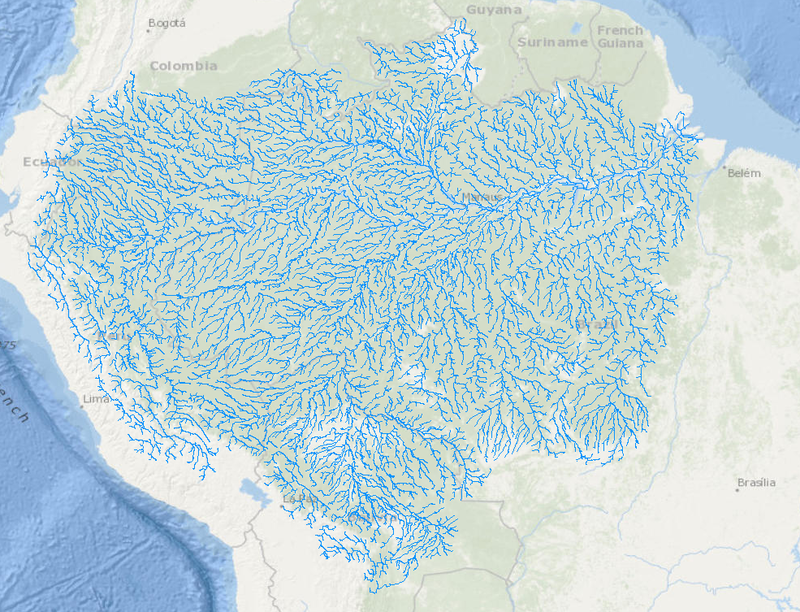 The Amazon basin, provided by Eduardo Vinticinque, SNAP Amazon project. Below is a zoomed in section of the network showing pseudo nodes as black points. A fragment of the Amazon network showing many pseudo nodes. Such a network can cause some recursive algorithms employed by RivEX to reach such depths that they cause a stack overflow error. This can be resolved by using RivEX to remove pseudo nodes. This simplifies the topology of the network and can significantly reduce the number of features in the dataset without loss of connectivity or change in geometry. The Amazon network shown above was processed by RivEX to remove pseudo nodes resulting in a new network comprised of 9,093 polylines, a massive 97% reduction in network edges by simply dissolving polylines into each other where they share pseudo nodes. Such a massive reduction in number of polylines means the topological dictionaries created by RivEX are significantly smaller, load faster, processes faster and will not encounter stack overflow issues.